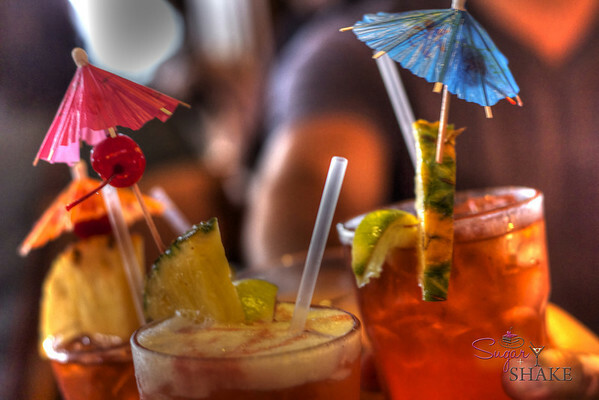 Tiki drinks get a bit of a bad rap. OK, the tiki drink you’re most likely to encounter is probably Technicolored, too sweet and vaguely tastes of licking a tourist. But they’re not all bad. No one will ever accuse them of being a sophisticated craft cocktail, but when made with fresh juices, they can be oh-so-refreshing and fun. You can’t do much about the retina-scorching color, but that’s part of their charm. A Sugar + Shake favorite spot for ordering drinks with silly names is La Mariana. Tucked off a crappy back road in a Honolulu industrial area, under the path of the jetliners, you can order your Zombies and Hawaiian Sunsets while sitting amidst carved tiki pillars and pufferfish lamps. 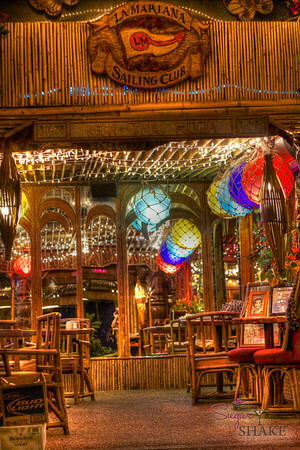 It’s probably the last true tiki bar left in Honolulu; it looks set-decorated to fit the Hollywood idea of an Island rum shack, but it’s all authentic, furnished with nets and shell-encrusted lanterns and glass fishing balls collected over the years since the ‘50s when it opened. It’s a great place to kick back with your turquoise blue drinks and collect a pile of drink umbrellas with friends because you couldn’t be pretentious here if you tried. It’s important not to be pretentious when you’re drinking something that looks like a birthday cake threw up in your glass. Don’t kid yourself. You’re loving it. Admit it. If you order the right thing, the food is surprisingly tasty (I once, against my better judgment, ordered a seared ‘ahi Caesar salad—it was good!) and while the drinks aren’t even close to what you’d call “hand-crafted with fresh ingredients,” they are rather well balanced and yummy. Be sure to keep count of your umbrellas because the drinks go down very easily; it’s easy to forget how many you’ve had until you decide to stand up. So while I’ve blathered on this whole post about simplicity and lack of pretentiousness being a key element in the tiki drink make-up, as we left La Mariana on our most recent trip, Shake mused, “I think I want to make a craft Zombie…like, with ingredients that lift it to another level…” Anyone got any suggestions for him? A note on the photos: These were all processed with the HDR technique. Some people like it, some people don’t. I felt the over-the-top high saturation was appropriate for a tiki bar. Click on the photo to visit the full gallery of images. I love love love La Mariana, it’s such a cute dive bar; agreed, the food is better than you’d imagine it would be based on the look/locale. Hi, Sugar and Shake! Another great post! For awesome tiki recipes, I highly suggest any of Beach Bum Berry’s recipes. Many bars in San Francisco consider him the Go To. I think The Scorpion is one of my favorites. Lots to try in there. Yummy, yummy, yummy. Sounds fun!! Shake wants to find a recipe for the gin punch bowl he had at Rickhouse in SF…wonder if there’s a similar one in there? Sounds like my kind of place! Let’s go there when I’m on Island!! Can’t believe you haven’t been there before, Kim! You’ll love it!